Did I mention that this has been the best Alumapalooza I’ve ever had? The attendees always seem to have a good time, but those of us in orange shirts tend to work long hours and run around solving problems ad hoc all day. This year I have to give the credit to the absolutely awesome staff who have made everyone’s life so much easier. We added two “orange shirts” this year and picked up about four others who have pitched in unofficially. They’ve all been great. This is making me much more optimistic about next year’s event in Sarasota FL, Alumaflamingo. There was a lot of talk about that event. Many of our seasoned team are coming to that event, and also quite a lot of the people who are attending here. Also, our new mascot, Sammy The Solar Squirrel will be attending. He makes daily calls on the staff radio channel to remind everyone to put on their sunscreen and drink plenty of water. Sammy has been a little disappointed lately. We’ve had intermittent showers Friday and this morning, which look likely to continue all day. Not much call for sunscreen. Yesterday we got halfway through the Backup Derby (using a 29-foot Airstream Ambassador) and got rained out. We had some pretty major showers during the Charity Auction but since we were all under the main tent, nobody minded. The Auction was a huge success. 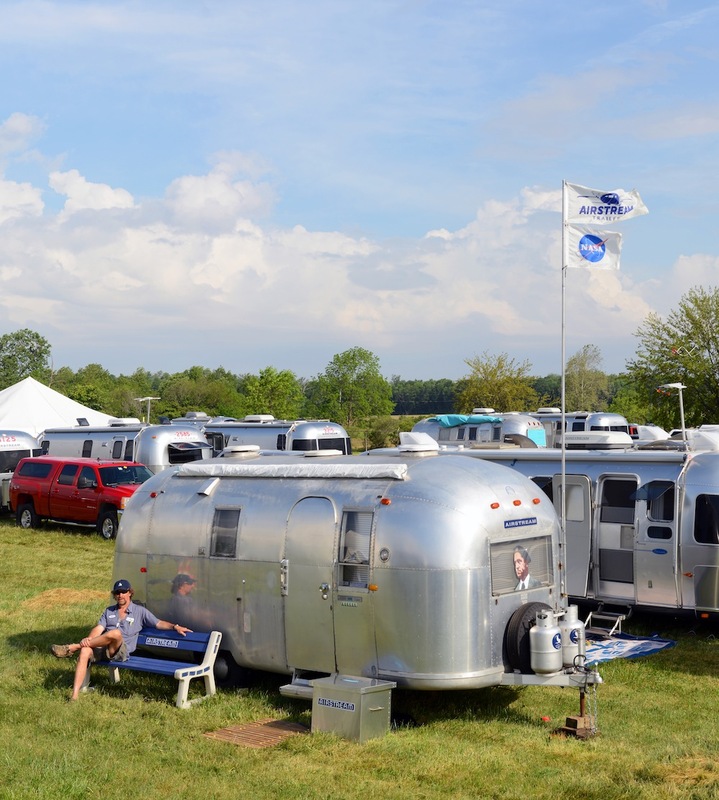 We auctioned off some Airstream art, a special edition “Alumapalooza 4” Zip-Dee chair, two Airstream scale models, one of Kristiana’s silver trailer necklaces, and a Lodge Dutch Oven. That raised $1,455 which will be donated to the Fish Pond, a local food bank. We also announced that the proceeds from the Aluminum Gong Show reached $818, which Brett and I pledged to match dollar for dollar, so the total will be $1,636 to be donated to the Red Cross for help with tornado relief in the midwest. Today’s events are mostly under cover, so the rain won’t matter. We already had yoga this morning, and Kid’s Yoga is starting soon. The Swap Meet was huge (I sold a couple hundred dollars worth of stuff myself) and Rivet Masters was a big hit according to Alex, who emcee’d it. In a few minutes we’ll start Eleanor’s “Aluminum Chef” demo and then if the weather holds we’ll resume Backup Derby at 2, then tonight we have some awesome door prizes, dinner, and The Trailer Park Troubadours. Alumapalooza 4 is almost over, and I think a lot of people here are sorry to see it end. Thank you for the updates this year. I can tell you are having fun too, because you have time to tell us about Alumapalooza. We have to live vicariously through the written word. I am enjoying every minute of it. My husband and I plan to be there next year.